Our thanks to David Lush for his support and enthusiasm towards the development of opportunities for our Parkstone youth sailors . 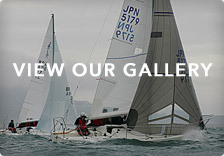 The opportunity arose to purchase two more J 24’s, at a very reduced price, from a Yacht Club in Devon, who, unlike Parkstone, was not able to find sufficient youth members to fully crew the boats. The new Youth Keelboat Class will be run by Liam Pardy and Sophie Pearson, who has just completed her Keelboat coaching qualification, and will mean that the Club will not lose sailors between 15 and 25 and provide crews for the various keelboat fleets. For 2016, one boat, ‘The boys boat with the Orange rudder ‘ will be supported by XP Rigging, and the team has arranged a full racing programme both at the Club and beyond. The other boat, you guessed, the girls boat with the Pink rudder, will carry on the campaign started by Sophie and Georgina Hepburn, who attended the Worlds in Germany last year and other events, they have ‘The Rig Shop‘ as their boat support, and our Club chandler, Quay West Marine , is helping support the whole project. 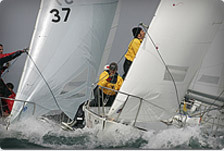 Georgina noticed that keelboat fleets to help transition from youth to adult sailing is common in German sailing clubs, and several Worlds entrants were Club boats. The boats are fully equipped with outboards and recent racing sails kindly donated by J owners Roger Morris and Duncan McCarthy. Vinyl Solutions, (The one with the Blue rudder! ) will continue to be the ‘feeder’ boat to the new Class, and all three boats will be used for training for the Parkstone Commodores Challenge, in future years. If you want to be involved, crew on a boat, help as a sponsor, or can give time, please do contact either William or Duncan via the contact page on the website, the boats can be chartered by members through the Club Bosun, and William will run a Thursday evening team for adults to start to learn to crew on a J/24. This is a fantastic commitment from Parkstone Yacht Club. For the youngsters going through the programme, what better for your UCAS or job application than experience in Team work, sailing, racing and helping manage the project, and unlike dinghy sailing, this is a team sport, so it is really inclusive, whatever your skills or abilities. Parkstone Yacht Club leads the way again once again !